I don’t know for certain but I’m guessing this shot was taken in the summer of 1962 or 1963. It fascinates me because it shows our city at a crucial moment of transition. Look closely at this photograph and think about what you don’t see. No Bonaventure Expressway. No Ville Marie Expressway. No Métro. No Expo. No Tour de la Bourse nor Chateau Champlain. And consider what you do see. Large neighbourhoods now lost to time; the Red Light, Griffintown, Goose Village, Faubourg à m’lasse. 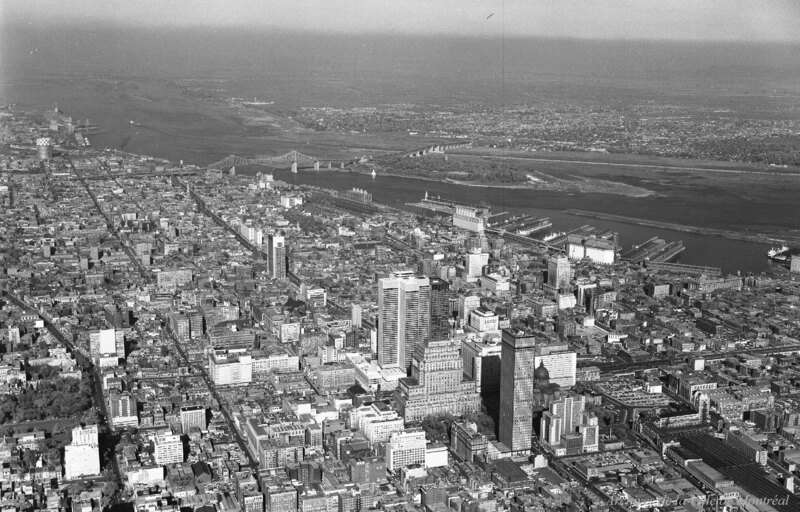 This is Montreal right before the slum clearance gets thrown into full swing, before the era of the wrecking ball. Les Habitations Jeanne-Mance has already been built but despite it’s arguable success as a housing project, would never be replicated in our city. There were many other massive, somewhat utopian housing projects intended for downtown Montreal, but the few that were ultimately realized, like Habitat 67, would wind up condos auctioned off to the highest bidder. For many this was not a particularly good time to live in Montreal, even if the economy was arguably stronger and there were greater local opportunities. For far too many, this photo is of a moment right before mass expropriations and the intentional destruction of urban neighbourhoods in the presumed name of progress. Dorchester Boulevard has been widened by this point and serves notice of the next phase of apparent urban renewal – the highways. You can see the blacktop cutting a nice wide swath through the downtown, reminiscent of the Lachine Canal further south – neat and boxy, the next commercial artery. Dorchester was widened at the expense of its former estates and grand churches throughout the 1950s, expanded from a quiet and meandering tree-lined residential street into a stately minor highway. The construction of the Bonaventure, Decarie and Ville Marie expressways further hampered the livability of the city for a considerable period of time, and we’re fortunate that there are plans in place to a) eliminate the Bonaventure expressway viaduct downtown and b) continue covering over the Ville Marie. In time we can only hope the remaining exposed sections of urban highway that have so thoroughly divided the city are eliminated as barriers. It’s a crucial component of our city’s urban rehabilitation. This is Montreal at a crossroads. The end of the North American colonial metropolis, the beginnings of both the international and the self-conscious city. The city you’re looking at was much smaller, geographically, than it is today, and when this photo was taken in 1962 the city’s population was only about 1.2 million people. 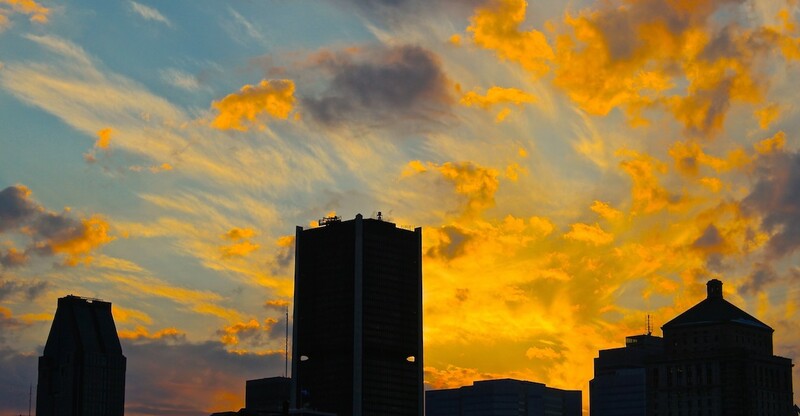 The population of Montreal would grow to nearly 1.3 million people by mid-decade, but then depopulated by about 300,000 people over the course of the next thirty years. The population of Montreal didn’t surpass the high water mark of 1966 until 2006, and only as a result of the municipal reorganization and forced annexations of some populous on-island suburbs. The reason I point this out is because this photograph represents the kind of built environment that developed to accommodate a city population that was once far more tightly packed at its core. Consider this. Were you to get in an airplane and fly to the same spot today and take another photograph and compare the two, you’d see there were once many more buildings in this city, though today we have many more tall and otherwise large buildings occupying massive pieces of urban real estate. In the photo above you see a downtown where commerce, retail, residences, industries and institutions existed practically one atop another. Today you’d see a largely corporate sector that in some respects has very little to do with what Montreal actually is. Industry and residential areas have been pushed to the periphery. Zooming in you can see Montreal’s downtown was once filled with a great variety of smaller office buildings, not to mention traditional triplexes, in places we no longer associate with small businesses or neighbourhoods. Much of the human scale architecture, the fundamentals of city-building, was gutted in the name of civic improvement, and worse, was done so in an area of exceptional architectural variety and vitality. But such as it is, it’s history. What’s done is done. We would be wise not to develop our city so haphazardly and inconsiderately in the future. Looking at this photograph I also see just how far we’ve come. In the thirty years after this photo was taken downtown Montreal transformed into a massive parking lot and the urban vitality of the city suffered. All too often whole blocks were wiped out before the intended replacement project had even gained funding (Overdale immediately comes to mind). Complexe Guy-Favreau, as an example, was an open pit for much of the 1970s. At one point the intersection of McGill College and Boul. de Maisonneuve was four parking lots and the Champ de Mars was a parking lot too (before someone had the bright idea to turn it back into a commanding public green and local historical site). Demolition teams tore strips through the cityscape to install Métro lines and highways, obliterating nearly everything in their paths with no concern paid to the negative effects it would have on local livability. We don’t develop like this anymore, and it seems as though a lot of recent attention – broadly speaking over the course of the last twenty years or so – has been placed on rehabilitation and rejuvenation, both of the core and the first ring suburbs (like NDG, St. Henri, the Shaughnessy Village, Plateau and Mile End). There’s no doubt in my mind Montreal is a superior city to live in today than at any point since this photo was taken. The city has more to offer its citizens today than it ever has, and I hope we soon start to realize this. For as great as past achievements may have been, they do not compare to what our accrued potential has made us capable of. Monsieur le Maire, Tear Down this… Railing? I don’t really know what to call that metal bar running along the edge of the property pictured above, but I’m pretty sure I know what it represents. I snapped this pic in Saint Henri but if you live in this city you’ve doubtless seen these pseudo fences elsewhere. They typically run just along the edge of a given property, though providing none of the privacy of a normal fence. The buildings inside the rail are always sullen looking, worn out and cheap. Unless I’m gravely mistaken, from what I’ve seen and heard, these rails not-so-subtly announce the presence of subsidized housing. If this really is the case, I’d like to know what the justification is. Perhaps it’s nothing more than a decorative element from a bygone era that serves no real purpose. If so, all the more reason to remove them. It’s not a fence, it offers no privacy nor added security. In every instance I’ve ever seen one of these they always look ugly – a half-hearted and half-assed rusting attempt at decoration that makes cutting the grass around it unnecessarily difficult. And if in most cases these bars do indeed surround city or provincially-owned low-rent housing, all the more reason to remove them completely and replace them with a proper fence. How is it beneficial to point out subsidized real-estate in a given neighbourhood? How does it benefit the residents, either of the building in question or those who live around it? It seems to me it would be more advantageous for everyone concerned not to draw attention to subsidized housing, so as to allow it to blend in seamlessly with the surrounding environs. So please Monsieur le Maire – tear down these eyesores. I’m sure there’s some money to be made scrapping the metal.